With millions of apps and hundreds of games available on the Google Play Store, sometimes it is a challenge to find good quality games. With that in mind, here we’ll be sharing one of our favorite racing games on Android. Perfect for those that have the need for speed. All you extreme sport and adrenalin “junkies” read carefully because we have a perfect proposal of a game for you here. 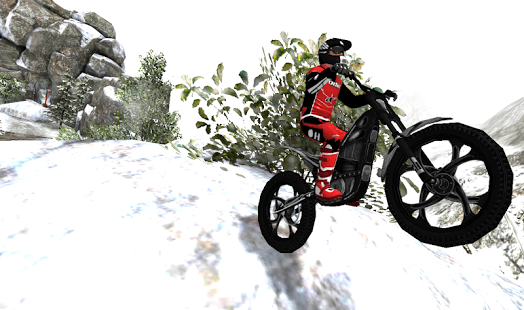 Let we introduce you a challenging motorbike racing game called Trial Xtream 3D with phenomenal graphics, adrenalin boost sound effects and amazingly designed levels for intense and insane game play and hours of enjoyment. With Trial Xtream, you can start a race on the unbelievable 3D trial bike and try to beat yourself with new records. The 3d bike game can also be frustrating and irritating if you’re stubborn, but if you learn to balance and control the bike riding then you can become the master of this game easily. As we say the graphics are so fantastic that you may not see better ones on mobile. The levels are created with an ambient of winter snow environment and mountain challenging tracks wich is a great recipe for hours of fabulous entertainment that you must experience it, especially if you’re extreme sports game seeker. Trial Xtream is available for free downloading on Google Play Store, so check it out on the link here and get the ride of your life. Enjoy it!